The new generation of our Coordinate Measuring Machine SIGMA / TETA is characterised by the highest precision, durability and nearly maintenance-free operation. The thermal stability and high precision of the guides guarantee the most accurate measuring results, even without the use of software compensation. 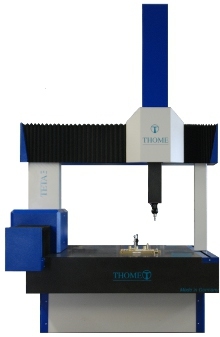 A double passive vibration damping system is integrated in the support frame of the Coordinate Measuring Machines. Additionally, all our CMMs can be delivered with an active pneumatic vibration damping system. This allows you to absorber even very low frequency vibrations. High-dynamic servo-motors and highly rigid, low friction belt drives guarantee optimized positioning behavior. Because of these characters our Coordinate-Measuring-Machines are particularly suitable for scanning! Our modular component system allows the combination of a lot of axis lengths. We would be pleased to produce your individually measuring machine for you. Especially the solid covering of the two table guides offers optimal protection against damaging during the loading and unloading of the CMM. Large center sleeve dimension gives optimal support against rotation around the Z-axis. Ideally suited for long probe styli. Also the pneumatic fine regulated counterbalance of the Z-axis. All probe systems (touch-trigger, scanning and optical) by Renishaw as well as the associated changing racks can be used. Point and surface lasers are also supported. Belt drives crossed by steel cords guarantee the highest rigidity at the lowest wear. That makes the measuring machine largely maintenance-free. These features are achieved through precious guide materials such as granite or ceramics. Optimized air bearings provide perfect, mechanical accuracy. This is integrated in the lower frame as a standard. 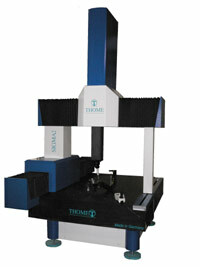 Thus, the measuring machine can be utilized ideally in areas close to production. Active vibration damping through pneumatic damping systems can also be adapted. Protection against dirt and thermal influences. The covered table guide also protects against damaging when loading the machine. 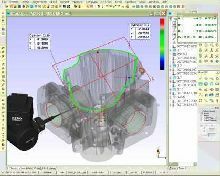 The new measuring software CAPPS is ideally suited for the measurement of all geometries, free form surfaces, and dynamic scanning. Measuring elements can be clicked and measured directly on the screen. In doing so, the generation of the measuring program takes place completely automatically in the background. The traverse paths are displayed on the screen and can be easily adjusted by the user if need be. Measuring against a set of data is turned into child's play. Extensive strategies for the measurement of point aggregates, individual surfaces, or groups of surfaces are available.